I owe my Beersoaked friends at Grand Teton a much better use of adjectives. My Bro Cesar and I enjoyed this on Memorial Weekend. Cesar and I grew up drinking coffee pretty early in life. With that said if you enjoy REALLY GOOD COFFEE this is the beer for you. Enjoy gourmet chocolate? Ditto! This is a beer to be savored!Grand Teton Brewing Company Imperial Stout Black Cauldron I owe my Beersoaked friends at Grand Teton a much better use of adjectives. My Bro Cesar and I enjoyed this on Memorial Weekend. Cesar and I grew up drinking coffee pretty early in life. With that said if you enjoy REALLY GOOD COFFEE this is the beer for you. Enjoy gourmet chocolate? Ditto! This is a beer to be savored! 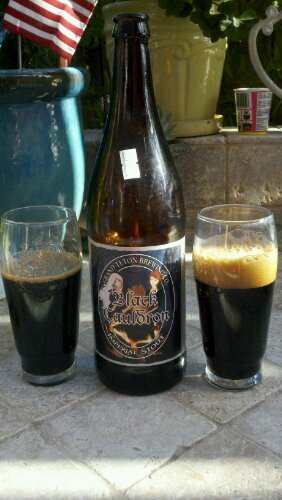 This entry was posted in Imperial, Stout and tagged Black Cauldron, Grand Teton by Guido. Bookmark the permalink.